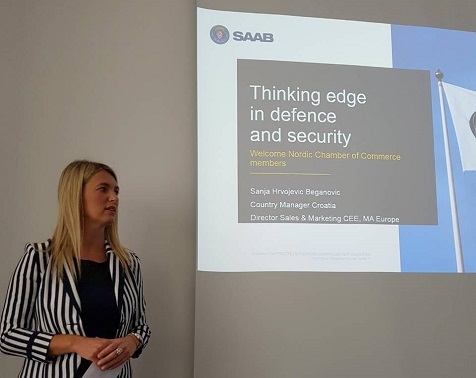 Nordic Chamber of Commerce, in cooperation with its member company, SAAB International AB organized on 27 September 2018 working visit to the company. Upon the initiative of the Nordic Chamber of Commerce in Croatia, and in cooperation with Swedish SAAB International AB, representatives of Nordic-Croatian business community, business partners of the Nordic Chamber of Commerce, as well as representatives of different Embassies, had the opportunity to visit and learn more about this Swedish company that serves the global market with world-leading products, services and solution from military defence to civil security having operations on every continent. Guests were welcomed by company’s management Mrs. Sanja Hrvojević Beganović, and were given a presentation of the company, as well as a presentation about planned future projects. Second part of the program was reserved for Q&A, networking and refreshment. Nordic Chamber of Commerce initiated this visit with the objective to present one of the most successful Swedish companies, but also to give its members and business partners an opportunity to establish new contacts and business opportunities, as well to exchange business ideas and experience. To view the photos from the company visit, please visit Photo Gallery.